An individual basket with a few add ons. Just the right size for two people with a garden. Or a single person. Or a couple who eats out a couple of nights a week. 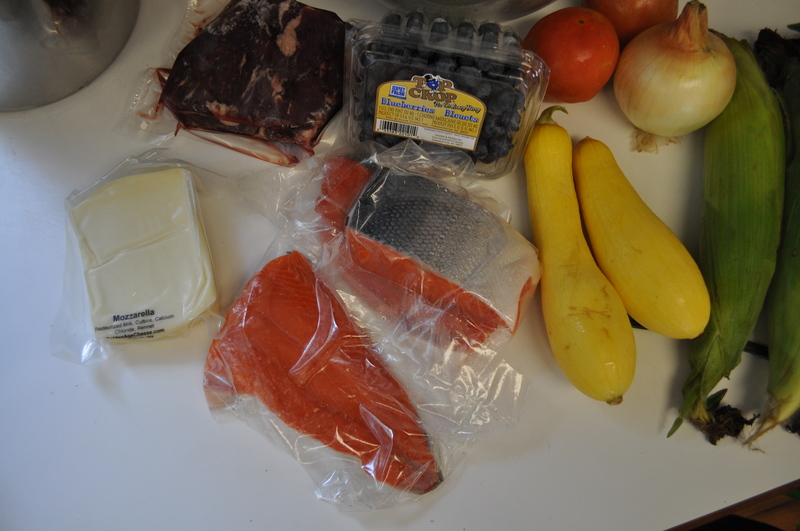 This week our proteins were chuck roast and sockeye salmon. Since the salmon was an 8 ounce individual filet, I could email or call or register on line to order another portion or two. This week’s cheese was mozzarella. Perfect for the two tomatoes in the basket, and my basil from the garden. Or with all those supersweet 100s I am getting from the garden. We got a large onion. A couple of yellow squash (like I need squash). Actually, putting them away to make ratatouille next week when we are supposed to get eggplant. Blueberries. Yes, there will be frozen berries. And lemon blueberry zucchini bread. There were two ears of very sweet corn. It is gone already. I did ask for additional and will be billed for three more. 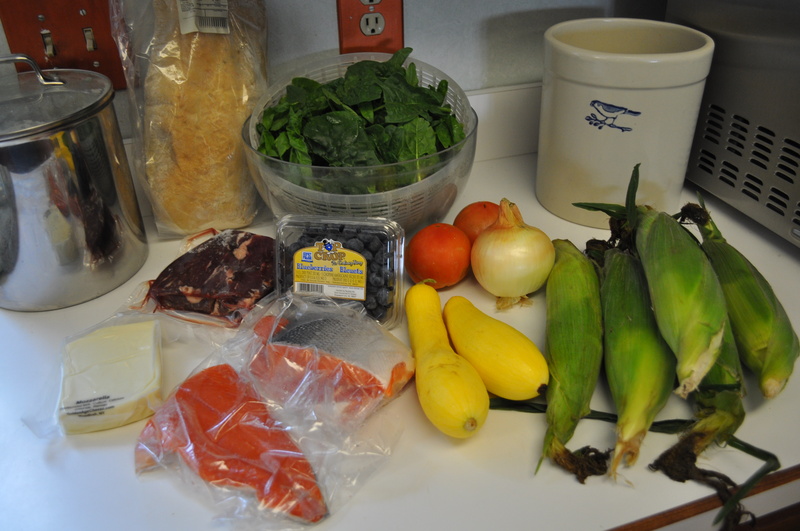 Dinner Thursday night was sockeye salmon and corn on the cob. Nothing else. Well, there was wine. The last things in the basket were the large bag of mostly baby spinach. Which makes perfect salads. With that smoked bacon from last week. I wasn’t in the mood for the fresh bread choices this week so I got one of these. 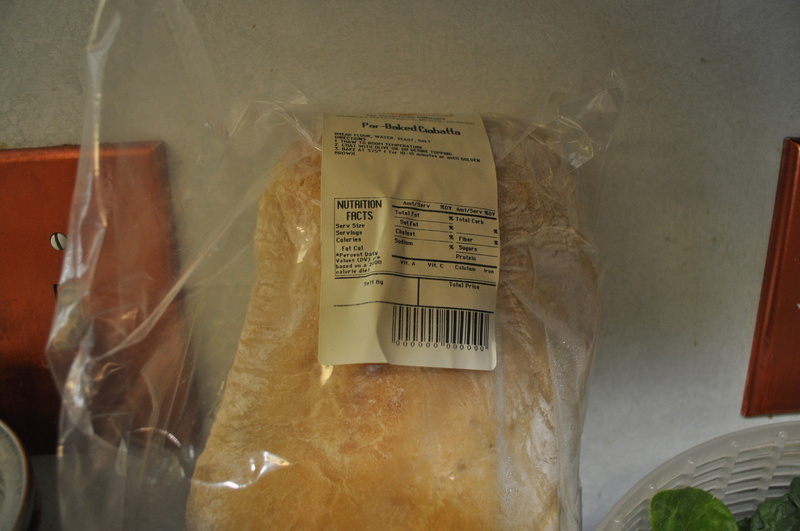 A parbaked ciabatta. Sitting in the freezer waiting for me to need it. Upcoming meals will include a caprese salad, obviously. A spinach, blueberry and walnut salad one night. That ratatouille next week. Chuck roast is in the freezer waiting for cooler weather. Posted in Food, Friends and Farms, Local Businesses, Real Food and tagged cooking, Food, Locavore, real food. Bookmark the permalink.